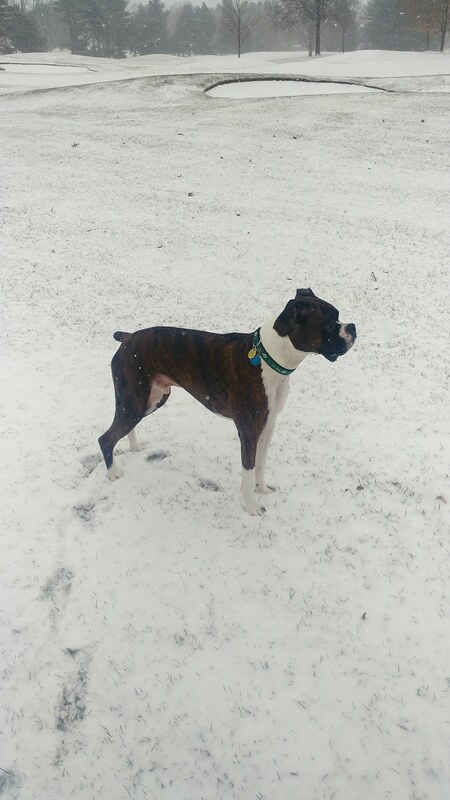 Happy New Year to everyone reading the blog! 2018 has started out quite cold with exception to yesterday’s quick thaw. 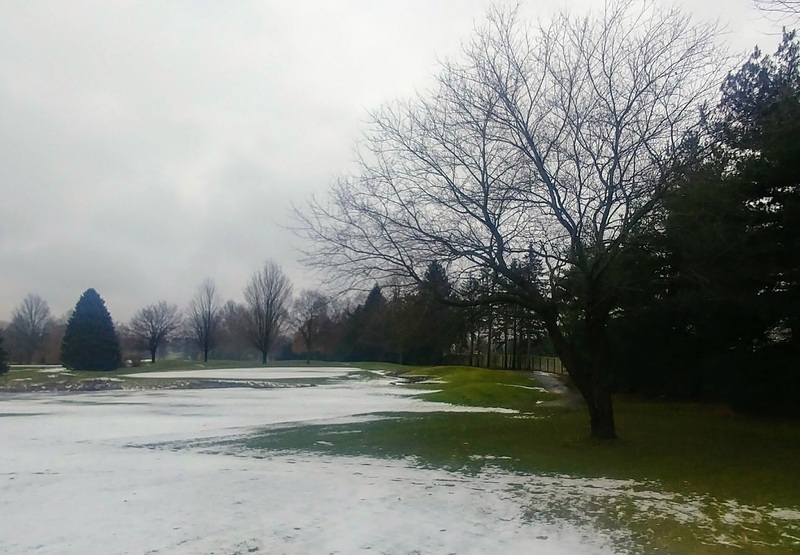 Although reality has sat back in today with a quick hitting ice and snow event, yesterday gave me a chance to evaluate the golf course and grounds. Except for an active mole near the practice facility, I am happy to report no issues on the course. 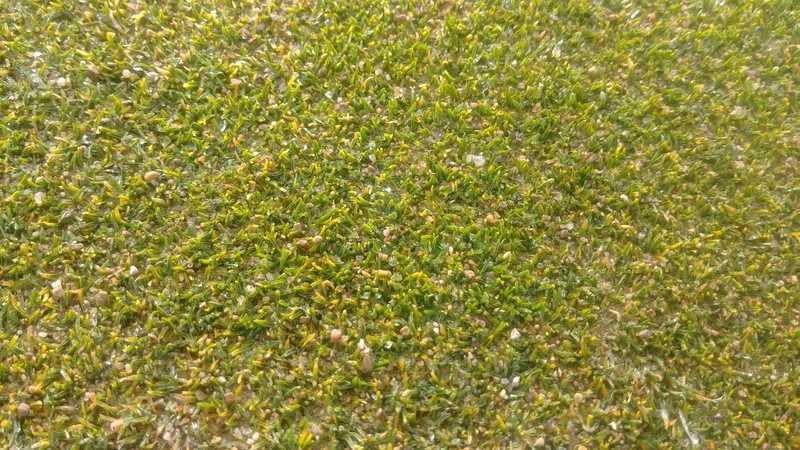 The Poa on the greens looks great, and there is still quite a bit of protective sand around the crown of the plant. Bowser has even enjoyed our course inspections the last few days. Much of our equipment maintenance happens in the months of January and February. 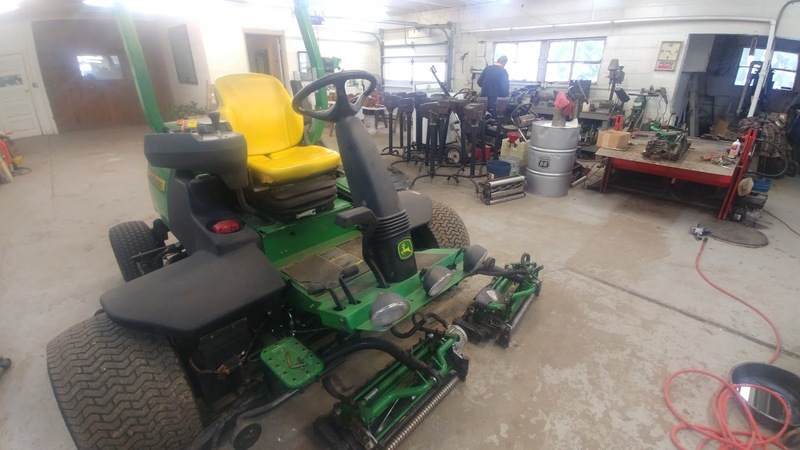 All of our mower reels and rotary blades are sharpened for the upcoming season, and routine maintenance like oil and fluid flushes are performed as well. The second picture shows our Equipment Manager, Steve Ott, using a torch to heat and remove a failing bearing and cup from one of the rollers on a fairway unit. On an important side note, the 2018 season marks the beginning of Steve’s 39th year of service at Elcona. His dedication, knowledge, and ingenuity to the club and our department is utterly invaluable and I am quite thankful to work along side him each day here and call him a teammate. In the spring, if you see him out and about on the golf course, please stop and thank him. The staff also does a wonderful job refurbishing all of the various markers and supplies you may utilize out in your round of golf. 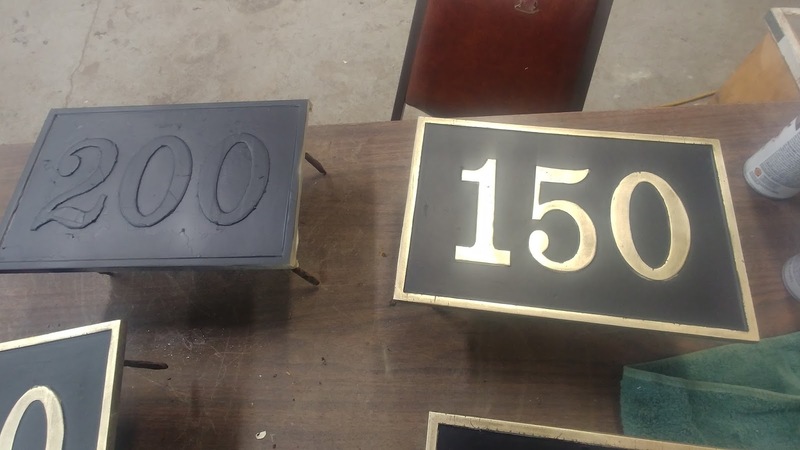 The brass fairway markers are taped, and 2 coats of black paint are applied, followed by tape removal and 2 coats of clear coat to give it a glossy shine. 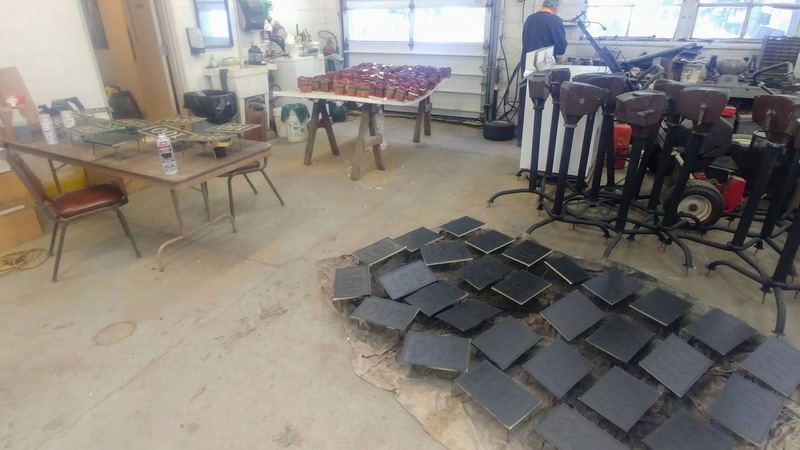 The tee markers in the background are sanded down, re-stained, and given a coat of spar urethane to prevent the elements from damaging them. All other course supplies, like ball washers and litter baskets are touched up as well to provide a great look for the upcoming season. Finally, our tree work is coming along quite nicely. The list is much smaller this year compared to previous years, with an continued emphasis on turf health and aesthetic improvement. Our staff is also concentrating on trimming several oak trees on select holes after tree removals have been completed. 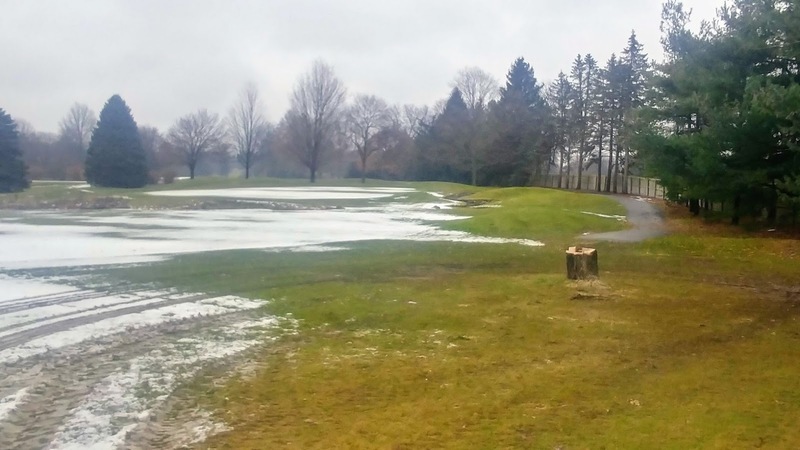 15 Colorado blue spruces were removed from the south side of the club drive last week. 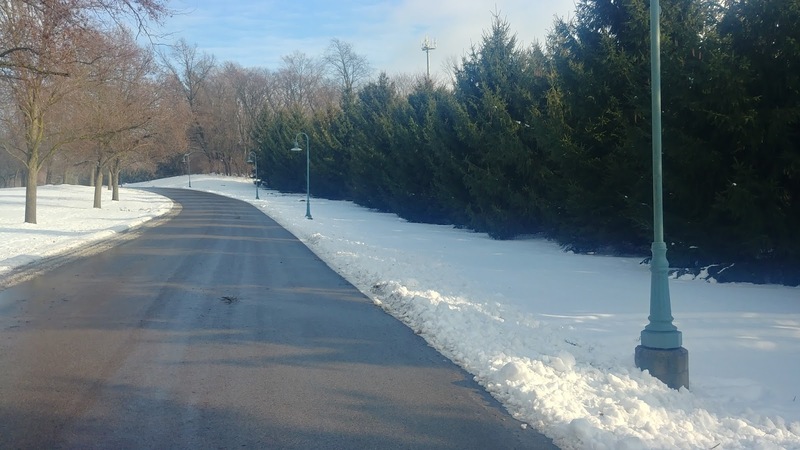 These very large trees were removed due infection from Phomposis blight, a canker disease that has become more prevalent in the Midwest in the last few years. The aesthetics of these trees had created a poorer aesthetic for members and guests entering the club. 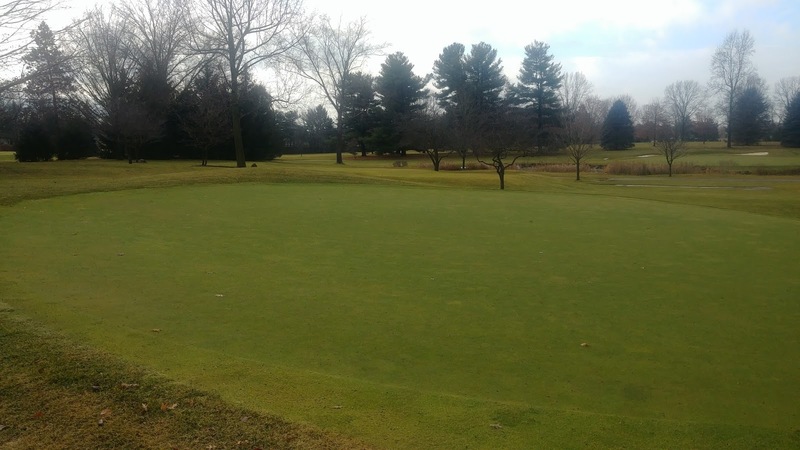 In the spring, irrigation will be installed and the bare areas will be repaired with sod. 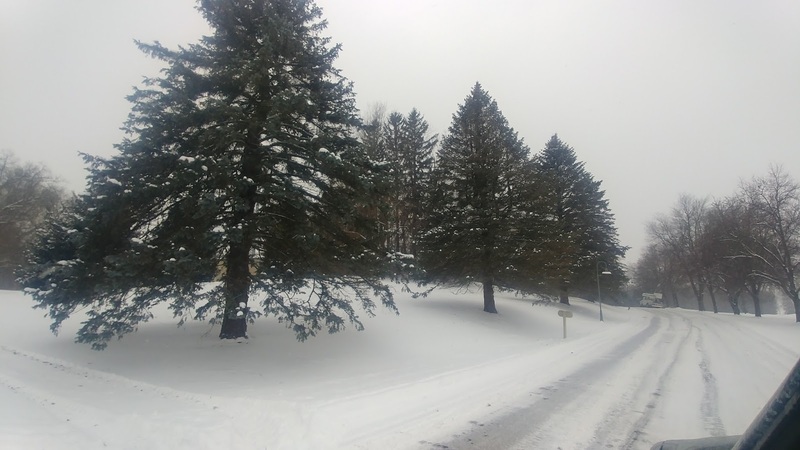 Michigan State has a great extension article on reasons on Spruce tree decline, which you can read more about here. 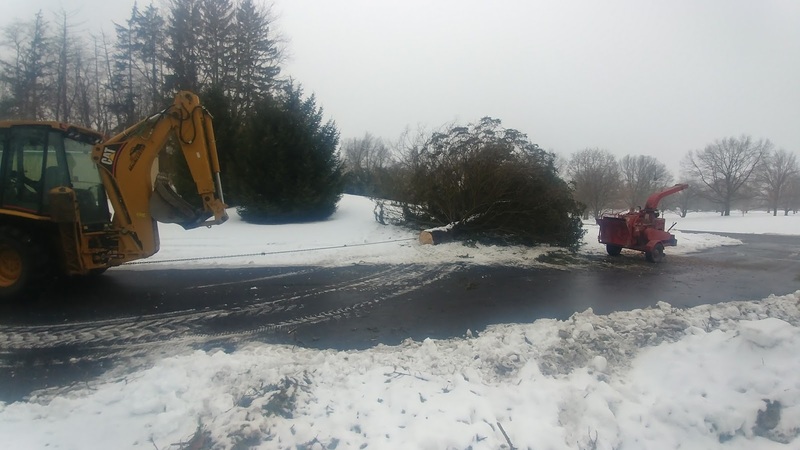 This removal also is another demonstration of the planning that goes into the tree program. Many years ago, a plan was developed to replace these trees with a group of Norway Spruce to better screen US 20. 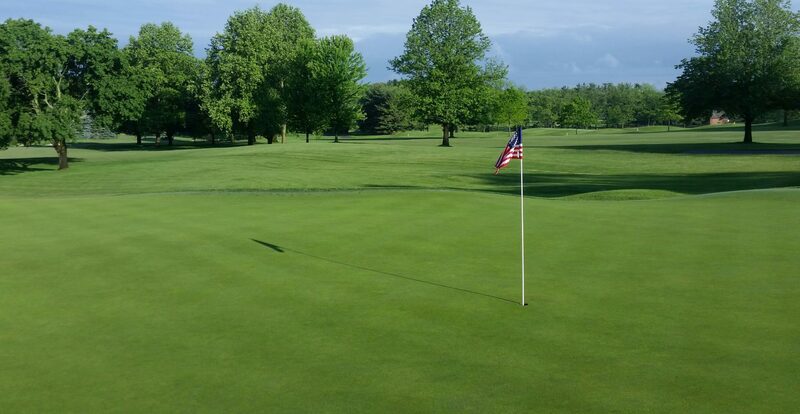 As the Norway spruce behind them matured and further screened US 20, the Blue Spruces could be removed and not hinder the club with a view of US 20. Tree service hauling them to flat ground for clean up. Note the thinning lower branches. 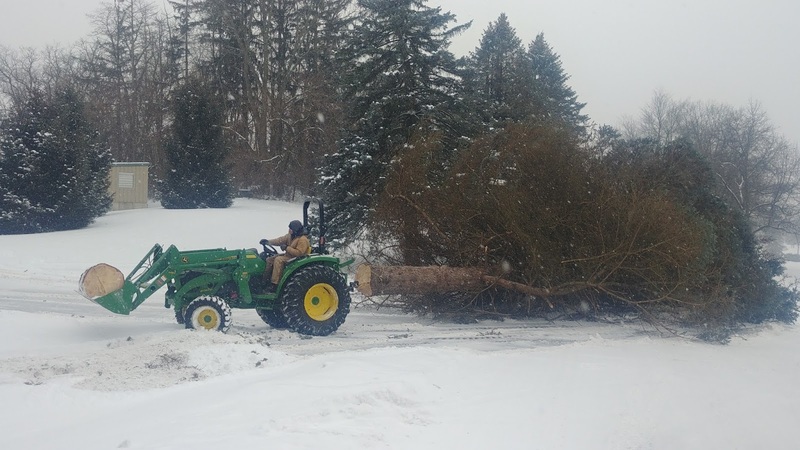 Our staff dragging a spruce to flat ground for safer clean up. On Hole 15, the red maple closest to the cart path and Zimm’s Creek was removed. The turf in this area the last few years has become thinner and less playable for approach shots that land here. The resulting removal will allow for drier, more playable shot attempts from that area. If you have any questions, please email me at ryan@elconacc.com. Please stay warm this month and I will have further updates on our activities on what is shaping to be another busy year for our department. Have a great weekend!